I’ve returned from a trip to the island of Fuerteventura with my camera a little sandier and more used than before my departure. It’s part of Spain’s Canary islands, basking in the Atlantic Ocean off the coast of North Africa. It’s a fairly rocky, dry outcrop boasting very warm weather, sparkling colours – and even Sahara-esque sand dunes. 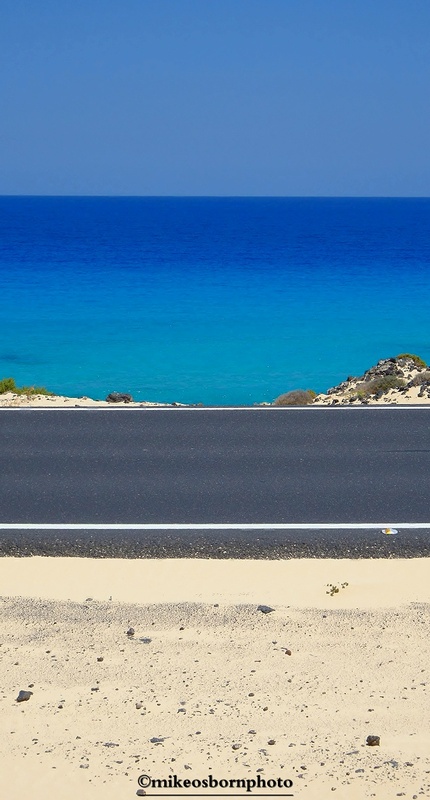 This taster shot says it all in a layered cake – electric blue sky, azure waters, plenty of sand and a modern tarmac road through the middle. It was a fruitful place for photography, and I’ll bring you more from the island in forthcoming posts. This looks great. I look forward to seeing more. Me encanta Las Canarias! Thank you very much! I came back with plenty of material. It was my first Canarian experience and like you I was quite taken.